Young Islanders learned about the legislature’s history and met the remarkable women of PEI’s Famous Five to mark the United Nations’ International Day of the Girl Child. Today, the Deputy Speaker of the Legislative Assembly of Prince Edward Island welcomed young Islanders from across the province to take the seats of their members of the Legislative Assembly (MLA) for a day of learning and sharing. 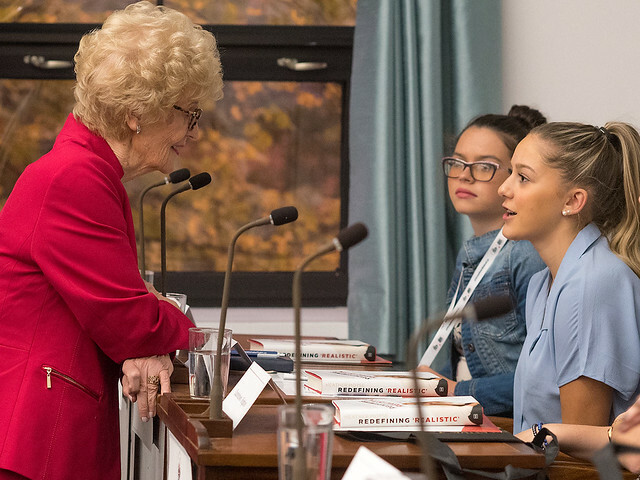 Nominated by each of their MLAs, the young Islanders learned about the legislature’s history and met the remarkable women of PEI’s Famous Five to mark the United Nations’ International Day of the Girl Child. They also heard from Olympic gold medalist Heather Moyse and discussed the challenges that persist for women and possible ways to overcome them. “On Prince Edward Island, we have made strides in advancing gender equality but there is still work to be done,” said Minister Responsible for the Status of Women Paula Biggar, “Today, I could not be more encouraged and hopeful as I saw young Islanders assume the privilege and responsibility of sitting in the legislative assembly. They shared with us the challenges they face and their vision of a bright, inclusive future that affords all Islanders equal opportunities”. “Today has been an immense privilege. I sat in the seats of our representatives,” said Rikki Delaney, student at École Évangéline. “I learned a great deal, I was inspired and I will be leaving today with a unique experience that I look to share with my friends, family and community”. The day’s events were organized by the Interministerial Women’s Secretariat, which works within government and with community organizations on initiatives that help carve pathways to achieve greater gender balance. Learn more about the United Nations International Day of the Girl Child.